Buyer must pay return shipping & handling and the book must be in like new condition. Excellent book for children to learn manners & etiquette. The book is a different & child friendly approach for kids to learn from. Very creative, that’s why I ordered two! Thank you Susan for your purchase and support. Our son is 7 and learning how manners can create positive interactions versus negative outcomes. This book gives him the WHY on using manners. The artwork is adorable! We are witnessing our son suddenly using “the magic words please and thank you” more and more! Even asking for permission! (Shock and awe!) I highly recommend this book for your little ones! Thank you Carly! This is exactly what our intentions were with the creation of the book. This makes us happy! Wow! Is the best word to sum up this amazing book about manners. It not only gives a great detailed story of using manners but it is a true guide. Many children live in households that manners are not a part of their day to day. After reading this book the importance and understanding of manners are clear. Also, not to mention the characters in the story that will have your little ones saying more than just please and thank you. 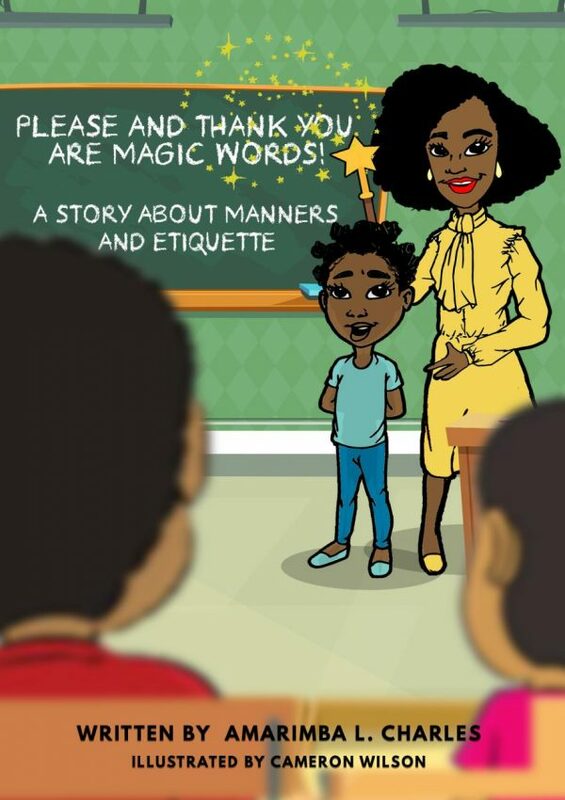 This is a book that will help kids understand and learn their manners and its uses. Thank you Shannae for your purchase and support. All I can say is WOWWW!!!! Amarimba, you have just made a significant shift in the realm of children’s books; especially for minority children. Thank you! I’d like to share a few of the major components that stood out to me through this book. The Vocabulary: Teaches kids and their parents the importance of embracing words and understanding the meaning and using words in their proper context. The character engagement is realistic and promotes student intellect over teacher’s expertise. Ms. Charles’ character is similar and aligned directly with the author’s true character. The visual representation and clear guidelines for implementing the etiquette methods (ie. do’s and don’ts at the dinning table). This is going to impact lives and empower youth for generations. Thank you. Thank you for your valuable feedback Margot. I appreciate you! My daughter received the book just in time for her birthday. We began reading the book as a part of our evening reading time. It is very easy to follow along. My daughter loves the photos as they reflect images that she can relate to. Please and thank you are magic words, is a book that should be added to the school curriculum. I am thankful to see a focus on etiquette. I am happy that your daughter received the book in time for her special day and you both are enjoying it!